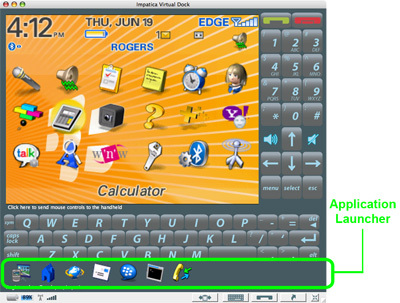 Application icons will automatically be added to the application launcher when the application starts on the BlackBerry. When an application on the BlackBerry closes, the icon will disappear from the application launcher. To switch applications, simply click the icon for the application you would like to use. To hide or show the application launcher, either click the application launcher button in the status bar or from the View menu, choose Application Launcher.